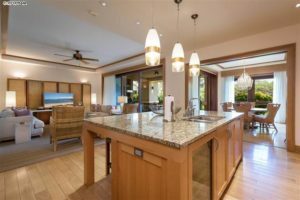 Listed early last month, Montage Kapalua 2206 is a great opportunity to buy into Kapalua’s most prestigious condo complex where the sellers have priced their unit well. Located on the ground floor, the villa is neatly laid out in a way that maximizes the flow and openness of the layout. With a square footage of just under 3000 sqft, the future buyers will get to enjoy West Maui’s newest luxury resort with world class amenities. 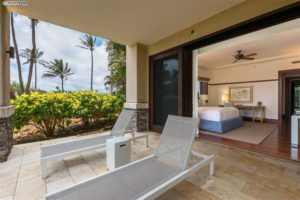 Located in building 2, the villa is provided with easy access to Kapalua Bay and the beautiful walking trails that wind their way through the Kapalua resort. As the lowest priced listing in the entire Montage Kapalua complex, buyers should act quickly before missing out! Also brought to market early last month, Montage Kapalua 2204 is a nice contrast in terms of design and floor plan. This unit sports darker wood finishes and a similar layout, albeit 200 sqft smaller than the unit above. With 600+ sqft of lanai space, the unit lives extremely large and is perfect for accommodating large parties or extra guests. With 3 bedrooms, 3.5 bathrooms, and 2789 sqft of interior living, future buyers will be impressed how the tall ceilings and open layout maximize a unit. 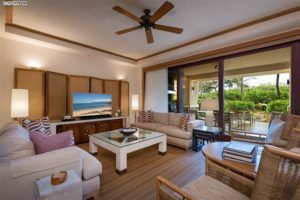 With 7 units already sold through the first half of 2018, the Montage Kapalua is looking like it will have a strong year with $32,125,000 sold in running sales volume. The majority of the sales have come in the 2nd quarter with 5 of the listings closing in May or later. So far May has been the most productive with 3 units sold, while January and April saw no units sold. The strong surge over the last 2 months coincides with the spring influx of buyers. Continuing with that trend, 2 more units are in escrow and the increase in activity can also be traced to the rise in summer visitors. Living in Kapalua comes with a certain price tag and buyers here are definitely in love with the relaxed and vibrant lifestyle. Towards the lower end of the market, buyers are paying at $3.5 million which buys them something similar to the 2 listings above. On the upper end of the market, 1 buyer paid well over the $7.7 million mark to secure their property. Buyers should expect to pay anywhere between $1200-$2000/sqft which is right on par with some of the best Wailea condos for sale. 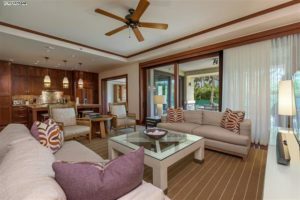 With 10 glorious Montage Kapalua Condos For Sale, buyers have all price points available to them. What is nice about the current market is the type of units available, at the moment there is a 60/40 split with resales and new developer offerings. The variety of villas for sale give buyers the opportunity to move onto another property if they are not able to negotiate a deal they are happy with. 60% of the listings have come to market within the last 3 months, while 1 unit has been on the market for 1+ years, and 2 more are quickly approaching 1 year for sale. The current inventory is predominantly in the $3 million range with the $4 million price point being the next one most heavily represented. The $5, $6, and $8 million sales point each offer 1 unit for sale. Buyers should expect to pay anywhere from $1000-$2200/sqft for a unit based on the current market conditions. The best way to stay in touch with the market is by subscribing to our Montage Kapalua new listing email alerts.